During the seventies, six photographs of light pillars in high clouds found their way to the Dutch-language popular scientific literature . Four of these (one black & white photo and three high-quality colour slides) were taken by amateur astronomer Frans VAN LOO from his former home in Itegem, Belgium (see OP-PH-01 to -03 in our picture gallery dealing with artificial light pillars). The photo below was taken on October 25, 1976, at 18h35 U.T. It shows pillar-shaped reflections produced by flares and unshielded lights in and around the harbour of Antwerp. Using the stars in the picture, we determined the position of the bright yellow-orange reflection in the lower central part of the image. The azimuth of this 2°40' long and 30' wide pillar was found to be close to 303° (when measured from North over East). The elevation of its brightest part was found to be 17°. A typical light pillar display photographed by Frans VAN LOO from Itegem, Belgium. The reflections were caused by flaring activities in the Antwerp harbour. The photo was taken on October 25, 1976, at 18h35 UT. 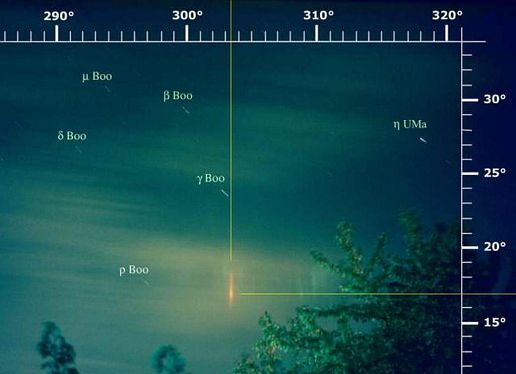 Stars are visible through gaps in the cloud deck. Yellow lines indicate azimuth and elevation for the centre of the main reflection. The distance between the spot from where the picture was taken and the location of the then largest standpipe at the petrochemical complex was 31.6 km or 19.6 miles. Map of Flanders, Belgium, with location of the main standpipe at the FINA ANTWERP OLEFINS plant (formerly PETROCHIM). α defines the picture angle of the transparency taken by Frans VAN LOO on October 25, 1976. The yellow line indicates the azimuth for the flare. The light source responsible for the bright pillar was a combustion flame emanating from a 204 m (669 feet) high standpipe at the former PETROCHIM plant, now operated by FINA ANTWERP OLEFINS, and located 31.6 km (19.6 miles) northwest of Itegem. Knowing the distance between the observer and the light source as well as the angular elevation of the streak, the altitude of the reflecting layer could be fixed at approximately (31.6/2 x tan17° =) 4.8 km or roughly 3 miles. Data gathered by a meteorological balloon launched from Uccle, Brussels, 5 ½ hours after the picture was taken, mention temperatures below -10° C at that altitude, a humidity exceeding 80% and winds blowing from the south at speeds of 60 km/h (37 miles/h). According to the official data gleaned from the archives of the Belgian Royal Institute for Meteorology, a low pressure area over Brittany, carried mild, sometimes unstable, maritime air over Belgium. The minimum air temperature that night was 8.2° C, the maximum temperature during the day was 12.4°C . Also visible in the picture are altocumulus clouds, smeared out by the long exposure time (180 sec, using an Agfa 18 Din film). These clouds were at an altitude of approximately 3,000 metres (9,842 feet). In his initial account, the observer added that cloud coverage was 4/8 and that no cirrus clouds could be seen during the display. This, together with the fact that even weaker stars are visible in the picture, indicates that the reflecting ice-crystal layer was very thin. Mr. VAN LOO further emphasized that the orange pillar remained in sight from approximately 19h15 till 19h45 and that its brightness varied from magnitude -2 to +1. The numerous weaker reflections, all but one of which are situated on the right hand side of the bright streak, were not visible to the naked eye and were caused by smaller safety flares and bright unshielded lights located in the same industrial zone north of Antwerp. - VAN LOO, Frans, "Ongewone reflectie" in Zenit, Vol. 2, No. 9, September 1975, pp. 316-317. - VAN LOO, Frans, "Reflectie van aardse lichtbron op wolkenlaag" in Zenit, Vol. 4, No. 5, May 1977, p. 181. - "Ongewone reflektie" in Zenit Vol. 4, No. 9, September 1977, p. 306. - VAN KAMPEN, Hans, "Nachtelijke lichten boven Nederland" in Aarde & Kosmos, March 1977, pp. 133-134. - GANTOIS, Jean-Marie & DE LOORE, Bert, UFO's en andere vreemde natuurverschijnselen, Thieme & Cie, Zutphen, 1979, pp. 65, 67/74-76 and cover. The picture we used as our case example accompanied the article from the May 1977 issue of Zenit.